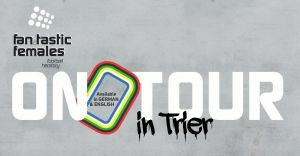 The exhibition will be hosted by Fan Project Trier. Schools are invited to take part in the mornings upon request. Presentation: "The Perl of the Terraces - Female Ultras between Adaptation & Rebellion"
Please note: the video portraits to scan via your smartphones are at the heart of this exhibition. This is why: bring your smartphones, your headphones and install a QR code scanner! Iphone users can scan the video content via their camera app. For Android users, we recommend the free app QRbot.